Things that make you go twit twoo! We’d like to introduce you to a very special Bakehouse character. 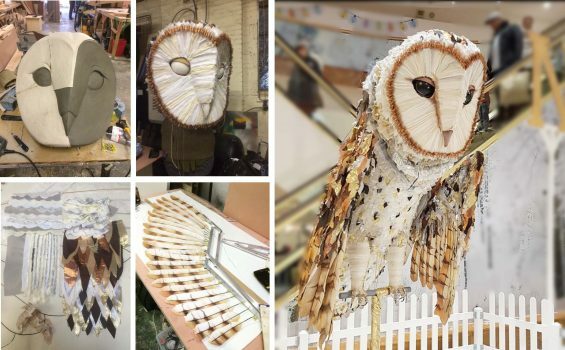 She’s a beautiful Barn Owl (the males are much paler and less interesting than the ladies…we’re not saying anything) that was designed and constructed by specialist makers and craftspeople in our workshop to make a magical Wishmas event really take off. One of the exciting things about being in the Bakehouse workshop is that we enjoy taking on new challenges and projects. We have made a number of large-scale interactive puppets in the past and so creating a mechanical puppet using pneumatics seemed like the obvious next step. We work with a talented team of makers from many different backgrounds who come together on a project such as this to bring a variety of approaches and skills to it. Research and design, carving and sculpting, painting and dying, metalwork and pneumatics – all of it gets done under one roof. The result is a magical owl that the whole team can be proud of, particularly when we see her ‘come to life’ with our performers and the pure joy that it brings to those to meet her. We’ve asked one of the team, our puppet maker Jess, to talk us through her experience on working on this Wishmas superstar! Where do you start when designing a giant owl? To begin with Design Director, Dan McGavin, and I had a few design meetings to talk through possible aesthetics and mechanisms for the owl. We discussed what features we would like such as separate blinking eyes, wing movement and body tilt. Dan wanted the look of the owl to be golden and white, magical, mysterious and enchanted… what’s not to love? I then did some fascinating owl research, and together we decided on the barn owl breed, using its colouring and features and making it magical with the use of golds, silvers, bronzes and glittery, soft, floaty fabrics. She’s a big and impressive marionette from head to tail she measures 2.5 metres and the wingspan is 5-6 meters. A huge mix including steel and aluminium framework, plastic tubing body shape, plastazote/ foam, PVA, plywood, clay, worbla – for the head, and wadding PLUS fifteen different types of fabric for the detailing, latex and scrim for the feet, polystyrene balls for the eyes, shock chord, springs and paints. What were the stages and how long did it take? After the design was completed my colleague Finn was able to make the clever frame, inspired by studying bird skeletons and wing movements, designed to give the head and body tilt. Whilst this was in construction I began sculpting the head. First, I drew the head to scale and then created a polystyrene former, almost like the skeleton to a body that I then (using clay) sculpted the head of the owl. I covered this in a plastic material which you heat and lay over the clay, creating a mask of the clay sculpt. I then made a Marquette of the individual eyeblink mechanism, and once both myself and Dan were happy I then made the real one built into the head of the owl. Next came the making, by hand, of tons of beautiful individual feathers by the wonderful maker Clem and myself. There were around 23 feathers per wing and hundreds for the body, the longest one reaching around 1 metre in length. Once glued and cut to shape we layed out the feathers and sprayed them so that the colours/ feathers blended into the next feather, we painted individual detail in each feather to give a beautiful texture and depth. After the body and legs had been made, each feather was attached individually with elastic running through each one to control the movement. Finn attached the pneumatics to the framework which controls the wing movement up and down and body tilt, all from a little remote help by the operator/puppeteer, this was then hidden by adding more detail to the wing.How long did she take to make? The whole process from designing to finished owl took around 6 weeks, with lots of hard work, testing, team working, head-scratching and painstakingly detailed making… but definitely worth it! I am extremely proud of what we achieved with this owl. What I wanted the owl to look like at the beginning matched the end result is exactly! I wanted the owl to look gentle yet have deep mystical eyes and to make viewers smile and be mesmerised by its scale and beauty. I feel that as a team we achieved this after seeing the reactions of the children, teenagers and adults who watched the owl come to life.